Inspire Pro is a painting app on the iPad that mimics the real life artistic process of putting a brush down and creating something beautiful. The app is true to life in the way that it presents you with a blank white screen and then puts you totally and completely in charge of where you want to go from there. 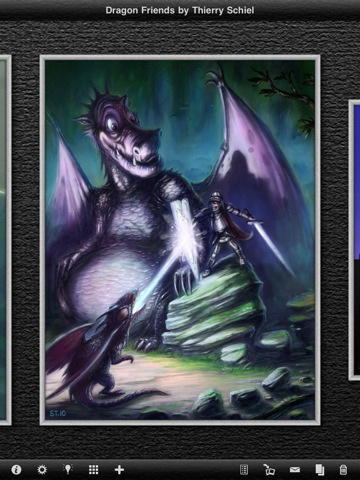 This app from Kiwi Pixel isn’t any paint by numbers experience, nor is it MS Paint with its retro design. Instead it’s up to you to blend colors, control dry brushes versus wet brushes, decide whether you want your brush to appear at one angle as opposed to another, and much more. This is an elegant app for artists and amateurs alike, and it’s extremely therapeutic. The app itself is straight forward and easy to use. The icon on the lower right hand corner lets you choose between any of the five brush types (flat, round, fan, clumped, or palette knife). The upper right hand corner displays the squared color icon, which opens up to a large menu. This menu includes a regular color ball that lets you select colors by pressing on the sphere. You’re also given a box that displays your most recent color choices and favorite color swatches, which you can easily modify with a quick drag and drop from the new color swatch into the favorites menu. Once you have your color you touch off the menu and become a regular Picasso. 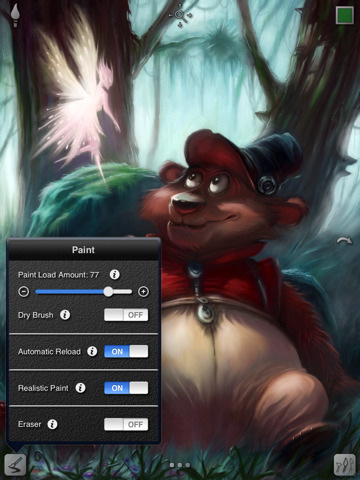 Inspire Pro loads your brush with varying amounts of paint based on your preferences, and you can choose how much you want to saturate your brush in the preferences icon in the lower left hand corner of the screen. There are also options for rotating your brush, changing thickness, or using a dry brush to blend colors. The inkdrop tool lets you pick and reuse existing colors from your canvas and the app provides up to 1,000 redo or undos to save you from any last second changes of heart. 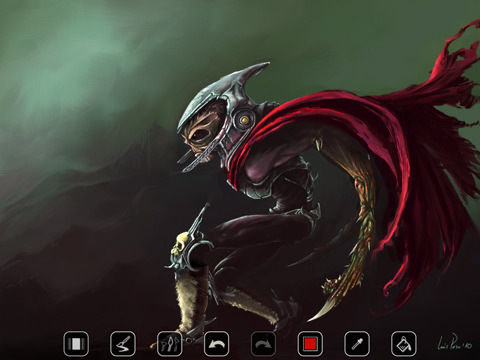 All technical features aside, Inspire Pro creates an amazing painting atmosphere. The brush strokes are incredibly realistic and it’s amazing to see how realistically the colors blend like wet paint on canvas. The palette knife cakes the paint on in a thick layered effect, making this the most true-to-life paint app I’ve ever used. Inspire Pro also boasts a feature that reacts to the amount of pressure you put on the iPad screen. * (See edit below) I didn’t see this effect, and I couldn’t figure out a way to create abstract paint splatters the way I would have hoped, but then again I’m certainly no artist. When you finish your masterpiece you can save it to the app’s gallery and export it to your iPad photo library. You can also send photos via email as .png files, but the app lacks any kind of direct Twitter and Facebook integration. Of course this doesn’t rule out sharing completely, it’s just more difficult than most other apps nowadays. 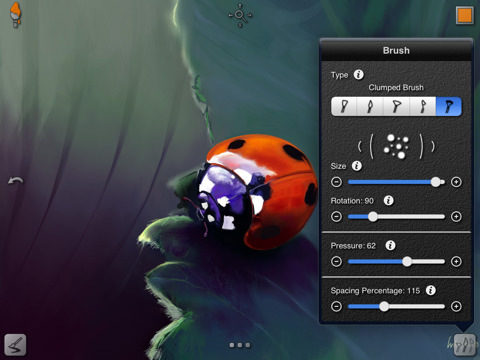 Bottom Line: Inspire Pro is a true-to-life painting experience for the iPad. It’s shockingly realistic and sure to keep you therapeutically entertained. Edit: Sorry Tapscape, I got this feature wrong. Inspire Pro doesn’t have that feature at all. Instead they allow you to adjust brush pressure on the canvas with a pressure slider in the lower right hand corner of the iPad screen. My apologies for misreading the feature.